Jungle Red Writers: Let's talk typewriters! HALLIE: I remember my love affair with the Remington typewriter that sat on a typewriter table (remember those?) in our family room. I loved the way its metal body smelled -- a lot like the hood of our Buick. I loved coming to the end of a line, hitting that metal handle, and sending the carriage return flying back to start a new line. I remember how dirty my fingers got when the ribbon ran out, and it was time to reverse the spools. How I wish I still had any of the dreadful stories and, heaven help me, poems, that I rolled off it. My mother and father were Hollywood screenwriters. They wrote a movie ("The Desk Set") with a computer in it named EMERAC (IBM's was UNIVAC) which Katharine Hepburn refers to fondly as Emmy as it spews reams of useless information and inadvertently (and presciently) fires everyone. She used that electric typewriter for years to type out movie scripts, the lines centered on the page, with three carbon copies. White-out and copy machines hadn't been invented. I remember everything about that machine, and especially that there was no lever to make the carriage return. 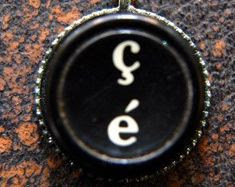 Just a button that sent if flying (they hadn't yet invented the key ball). And then, how sleek my first portable electric seemed, the one I took to college. In those days you have to remember, we thought bowling balls were portable, and this thing weighed only slightly more. When I see those bracelets made of old typewriter keys (I have one) it makes me sad to think of all those mutilated typewriters, moldering away somewhere. Do you all remember your typewriters, and was it a love or hate relationship? paper in French and then a senior thesis--so this was a necessary luxury! It was a very cute machine and I wish I'd kept it. I don't have such fond memories of the key punch machine we had to use to record hundreds and hundreds of data points for my graduate school research. Though it was fun when that tedium was over and you got to slide the stack of cards into the machine and watch the results come out. JAN: I remember when I started my first job at the News-Tribune, we had IBM typewriters. I remember swearing, A LOT. The first thing I noticed when I converted to a word processing system at the Worcester Telegram, was that I no longer swore when writing. There was no frustration. So no, no fond memories of typewriters, except..... My brother who passed a way tragically at age 26 used a typewriter to write letters. And he always made a carbon copy. He was a prolific letter writer and I have all his carbon copies. So I thank the typewriter for that! ROSEMARY: I don't remember typing that much - I must have been a terrible student! My typewriter was a small, orange portable as I recall. My sister had the same little number in blue. We shared one long desk that my uncle had made and with the orange and blue it must have looked like the office of the Mets or the Knicks. As it happens, while cleaning out the home of a recently deceased aunt, I just scored a beautiful old Royal and it's now in my office. It still works and the old dear even had extra ribbons, $1.29. RHYS: My relationship with typewriters was much more hate than love. Having to retype a page with 3 carbon copies when one made a mistake, which I did frequently having never taken a typing course. I was editor of my college newspaper and we had to type skins for the duplicating machine. Ah, the swearing that went on in the early hours of the morning when that blankety blank skin had to be retyped. Then I was doing PR for the California Nurses Association (yes, I've had a chequered career) and had to turn out a newsletter every night after the last session of their convention, again on a wretched duplicating machine. By then my language had become even richer. I remember applying for a job in Hawaii and having to take a test on a Selectric. I complained that I'd only ever used a manual typewriter. The large Hawaiian lady put her hands on her hips and declared, "Honey, there ain't a manual in these whole islands." Didn't get the job. The day they invented PCs was bliss for me. Now I can type as fast as I can think and changes are so easy and I never, ever swear! Well, hardly ever. HANK: My Gramma Minnie taught me to type...gosh, back in 1959? I bet it was. She had an Underwood, I think it was, that came in its own boxy suitcase. You'd flip it open, put it on the table, and type away. I LOVED it. Here's how long ago it was. I practiced by copying out jokes and essays from her stack of Readers Digests. So funny to think back on that. I was big on doing the vocabulary words---what was that section called? And of course when I started as a reporter, you could hardly hear anyone talk over the clatter of the typewriters in the newsroom. Now--it's silent. DEBS: My parents worked from home, so the clickity-click of my mom's typewriter and the ding of the carriage return were very much part of my soundscape when I was growing up. I, however, didn't learn to type until I took a break between institutions of higher learning (my very checkered educational career.) My parents sent me to secretarial school so that I would learn to do something that "could actually make me a living." We used IBM Selectrics, and I passed all my secretarial courses with flying colors, except--typing. I could never get my speed up to the required level with no mistakes. Now I type faster than I can think, and I don't bloody care if I make mistakes. I think word processing was the greatest thing ever invented. And I do make a living typing, which I think is nicely ironic. No nostalgia for typewriters here, although I do have a wonderful vintage Underwood that was a gift from friends. I keep it on the same desk as the computer, just because I like the juxtaposition. Please, share your memories fond and otherwise. The QWERTY lives! For reasons that escape me, my father, mother and grandmother all acquired matching Smith-Corona electric typewriters in the late 1950s. My mother ran a small interior decorating business, so hers made sense; my father's handwriting was atrocious, so it was essential for him. My grandmother's? I have no clue why she thought she needed one, but I took it over, and it saw me through high school and college--and I still have it, not that I've fired it up for decades. 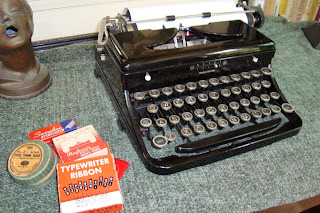 My mother couldn't read my handwriting and taught me to type on a old black Royal in 1958. Carried it around until 1996, when I got a laptop. LOVED that old typewriter. Except when I really got going and my finger stabbed the space between the keys. OW!! [HANK: I believe it was "WordPower" in Readers Digest every month. Sheila - that's so sweet -- matching typewriters! Oh, PJ, I remember getting my finger jammed and scraping the skin off to the cuticle OUCH. And learning to type! I put masking tape over the keys and practiced all summer the year when I couldn't get the summer job I wanted because, they said, I couldn't type. In retrospect it was probably more because I was only 15. I used typewriters in high school and computers in college. But I have three or four typewriters now, from an old Smith (before Corona!) to those that belonged to my mother and two grandmothers. We also have three old sewing machines ... we call it "curating" family history. I don't use them, but a couple of them sit out as decorations. Oh, sewing machines! That's another great topic. I learned to sew when I learned to type. I actually sewed a lot of my maternity clothes because what was available in the stores back then was so blah. Tie-died purple/blue/pink cotton! Made a great bullseye belly. I learned to type in high school on an black-enameled metal Smith-Corona; it dated back to at least my mother's college days, in the 1950s. It went with me for my own freshman year. Alas, I am double-jointed, and my pinkies can "lock" so that the middle joint doesn't move. The pressure required to type, particularly for the shift key, proved too much for those fingers, and I had to switch to an electric. By the time I graduated, I was using a computer instead, though I kept the electric typewriter for years. I have decorative typewriters also. In my office, an old Underwood and a slightly newer Royal. At home, a pair of matching Royals, one with a legal carriage. Wow, this does bring back memories. 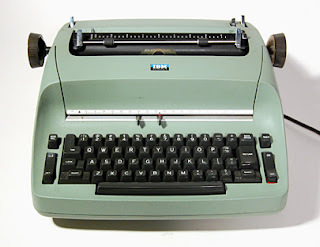 I broke my arm in second grade, and taught myself to type on my mom's gargantuan Smith-Corona Electra, so I wouldn't get behind on school work (I was also the nerdy girl who reminded the teacher when he'd forgotten to give everyone homework). I took custody of the typewriter from that point on - I still have a pile of terrible poetry I wrote on the thing in high school. I'm grateful for my laptop now, of course, but there is something wonderfully evocative about the sounds, smells, and feel of working on a real typewriter. Oh, yes, "Increase Your Word Power!" Exactly. Brenda, LOVE that picture of your transformed typewriter. I always think *cars* looks like people; never occurred to me that typewriters could, too. Way cool, as my daughter would have said. Jen - let's hear it for terrible poetry! Did you save it? 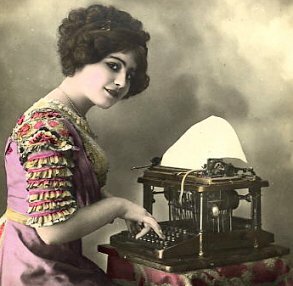 Did you know when typewriters were first invented they would not hire young ladies to operate them because women were too delicate to pound those keys. So only young men were "typewriters". They called the operatar the same as the machine. I think it was a good excuse to keep women out of the workplace. Especially when you consider that women in those days washed clothes, used mangles, beat carpets, had oodles of babies etc etc. Did anyone learn to type on a typewriter with nothing written on the keys? That's how I learned in a high school typing class more years ago than I care to remember. My grandfather gave me a Smith-Corona "portable" to take of to college. It was blue. I could type so fast that the keys would get tangled together. I was a slow convert to the word processor because the retyping process in revising seemed to make my brain work in a creative way. Don't ask me why! Now I love my computer. How did any of us get along without one. Eudora Welty used to cut her work apart during revision and spread it on a bed, pinning rearranged paragraphs with straight pins. Can you imagine? Rhys, I did not know that. How interesting. But what's a mangle? Patricia, that's how I learned to type, too. My husband never learned but he can go wicked fast with one finger. I STILL print my work out and cut it up. My outline, too. I can't see enough on a computer screen at one time to do the reorganizing that sometimes needs doing. Wow, so I join the USAF at age 17. I had taken typing from "'ol buzzard balls" in HS (it was a tough HS I might add...). Quicker than you can say Jack Robinson, which was just about the year BTW, they had me inputting vital DOD data on punch card machines (remember those?). First, Airman of the Year; then NCO of the Year; then off to law school, and one of the highest paid lawyers in the Pine Tree State (NOT one of the best, mind you, just highest paid). And all because of one high school typing class. Thank you so much "'ol buzzard balls"! Who knew....? When I started at the L.A. Herald-Examiner in 1965, everybody had a see-through Underwood and an ashtray, a floor around them surrounded by thrown-away paper. Sweeping the floors, emptying the trash, and filling the paste-pots with glue were my jobs. Many old timers also had a pint bottle of spirits on their desk. Recently my parents and I struck out trying to find their black, cast-iron ;-), typewriter in a box. Darn. 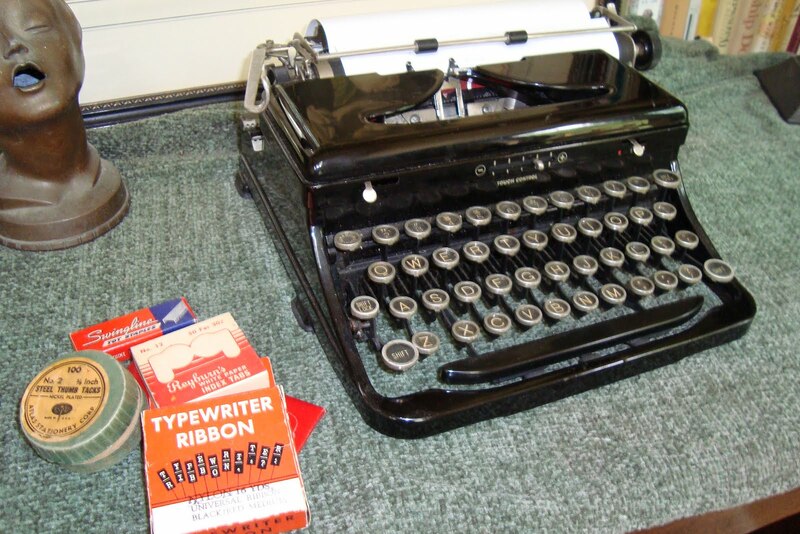 FYI, Tom Hanks collects old typewriters and occasionally posts pictures of them on Twitter. A mangle, dear Hallie, was a contraption to ring the water out of laundry. You put the item between two rollers and turned the handle. My mother tells the story of her brother putting her rag doll through the mangle and it came out really long,thin and flat. It also required a lot of strength to turn that handle. I think we call your mangle a wringer. As in "he really put me through the wringer." But I like mangle better. Much better. It would be a great title for a murder in a laundromat. Jersey Jack: GREAT description. I can smell the place. I'd love one of those typewriters. Really, Missy?! Would it be cool or what if Tom Hanks chimed in? Yoo, hoo!! Jack--did they yell "Copy, copy, copy!" They did when I started..nice memories. Except for all that smoke. My Mom had a thing she called a mangle. It was a roller that your put table clothes and sheets on and closed a hot metal thing. The roller rolled and the mangle ironed your sheets and table clothes. I remember pounding away on her black Remington portable. It was in a case and you set the monster thing on the table to type. Just as an aside, Hallie, I have to tell you that Desk Set is one of my favorite movies ever. I went to some trouble to find a copy to own, but it was worth it. I watch it two or three times a year. ...adore that movie. Love the bit when they're having lunch on the roof and he's trying to see how smart she is by giving her this complicated question about trains and stops...must watch again, I own it too! Old sewing machines...I have two old iron bases that I've turned into tables. Whenever I watch it again, I'm once again amazed at how much smoking and drinking the characters did in movies of that era. I remember being so amused when Word Star, an early word processing software program had a CR "command" (remember those!) which indicated ENTER in today's parlance. The CR was for "carriage return." No one under 40 would find that as amusing as I did. I bought a Smith Corona electric in 1971 that lasted me through college ('77). By the time law school got going, word processors were taking over. Early on, I used it in my dorm room. The housemaster below advised me one day that I couldn't use it after 11:00 pm, because the thud of the keys and returns vibrated into his bedroom. He said it was like an old man tapping his cane on the floor. What a great image, petemorin: "like an old man tapping his cane on the floor." Housemasters -- I wonder, do they still have those, too? @Hallie Oh YES, Hallie, they sure do! They're not called "masters" anymore though. Are you guys familiar with the Leroy Anderson composition 'The Typewriter'? I had the honor of playing it some years ago with the Port Angeles (Wash.) Symphony. Another musician, Jay Williams, and I rewrote the solo typewriter part for two dueling typewriters. Jay is a blind trombonist who collects and repairs typewriters, and he furnished us with two vintage models for the concert. We performed it face-to-face in the center of the stage. A terrific memory.